I don’t usually like to talk about all the charity work I do. That’s because I rarely do any, save for giving the odd tenner to mates who are doing a bit of fundraising and, of course, regular donations to the Broleur Beer Beverage Benevolent Fund (BBBBF). 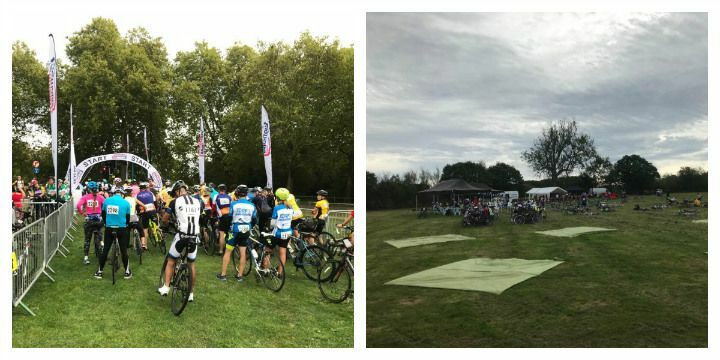 All contributions are welcomely received.The London To Brighton Bike Ride was something different, though. Not only because it’s one of the more iconic routes in the south-east, and not because I could raise a bit of dosh for my chosen cause, We Are Family. I’d wanted to do London-Brighton for a long time because it pulled at my taut heartstrings. It had a sentimental allure.Twenty years ago, I remember our Dad rode London-Brighton, along with our Mum, Sisteur and our Broleur-in-law (although it must have been the BHF version). I can still recall how awe-struck I was when he recounted Ditchling Beacon and just how tough he found it; when he talked about the bonhomie between the riders, and about the wonderful support they received at the finish.‘Big John’ might have struggled up Ditchling because he did it on an old-school mountain bike so heavy it was probably forged in Mount Doom along with the One Ring. Even so, his achievement – and our family’s – made this a must-do event in my mind. Having cycled down to Brighton from London a good few times, I knew the distance – 90km – wouldn’t be an issue, nor the climbing. Tough and unpleasant as Ditchling Beacon undoubtedly is, it’s no Mortirolo – our new standard-bearer as the most stupendously hard climb we’ve done. The first few kilometres through Balham, Tooting, Mitcham and Carshalton and out towards Chipstead was a very genteel affair. It’s best to get going as early as possible, though, to avoid any traffic. No one was jostling for position and no one seemed to be forming groups. Everyone seemed to be content to go at their own pace, which was fine by me. It was only after I’d hunted them down one by one and crested the climb that I realised I was feeling deflated, not elated. There’s a time and a place for acting like a tool – and London-Brighton is neither. There’s no glory in dropping the hammer past riders who are already having to walk. As my American wife all too often says, I was being “such a jerk”. Time to wind my neck in and quit with the oneupmanship as we wound our way through the countryside to the rest stop at Turners Hill, some 50km into the ride. 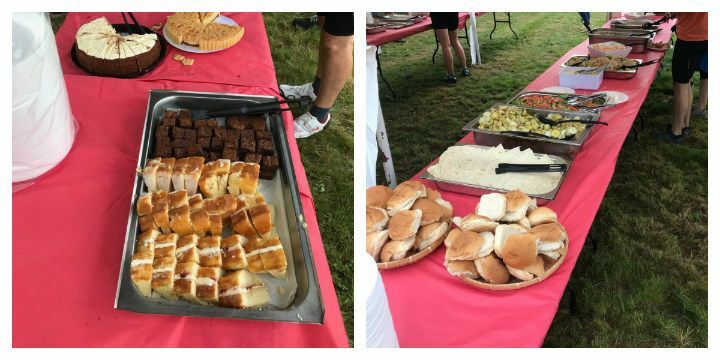 Many of the bigger, more famous sportives could learn a thing or two about feed stations from London-Brighton. Chapeau to the organisers, Skyline Events, for putting on a fabulous spread. Loads of room for people to stretch off, toilets where there wasn’t a ridiculous, bladder-bursting queue, chairs, tables, non-intrusive music, a guy on the mic who wasn’t incredibly irritating and, best of all, proper food. Not an energy gel in sight. For the savoury selection, there was pasta, rice, rolls, coleslaw, potatoes, boiled eggs, salad, ham and chicken. Then, for the more sweet of tooth, brownies, cake, fudge… Top marks all round, they got it spot on. Whereas I don’t usually like to dilly-dally at feed stations, getting in and out as quickly as possible like an undercover operative, I had to make an exception for this buffet and took my own sweet time. Very sweet in fact, as I wolfed down a third brownie. From there, it’s only about 20km or so (and mostly downhill) to what London-Brighton termed ‘The Big One’, Ditchling Beacon. Having ridden up it a couple of times in the Puncheur, I knew Ditchling is not a climb to be taken lightly. 1.5km long and at an average of about 9%, it’s no joke. Pretty much everyone I saw seemed to be walking – and there’s no shame in that. The first time I did Ditchling, I managed to shear off my derailleur after switching from the big ring to granny gear and toppled over. But, with the road closed to cars for the event – a nice touch – I didn’t have to be barking out, “On your right”, or having to weave past people. There were also some bellows of encouragement from – without going too Game of Thrones on you – the ‘Walkers’. Once you get into Brighton city centre, it does get a bit stop-start unless you’re a complete chump and jump the traffic lights – and I saw quite a few doing just that. Without wanting to preach too much, please don’t, cyclists have a bad enough reputation as it is. You can stop your Garmin, Strava, Wahoo or whatever, it will all be OK. I find it as irritating as riders who drop their gel wrappers like they’re on the Tour de France. Anyway, let’s get back to the sportive. After taking a left at Brighton Pier, you get a wonderfully flat finishing straight along Madeira Drive. With the beach and sea to your right and lots of marshals – who were great by the way – and supporters cheering you on, it’s a fantastic opportunity to sit back and soak up your achievement before crossing the finish line. 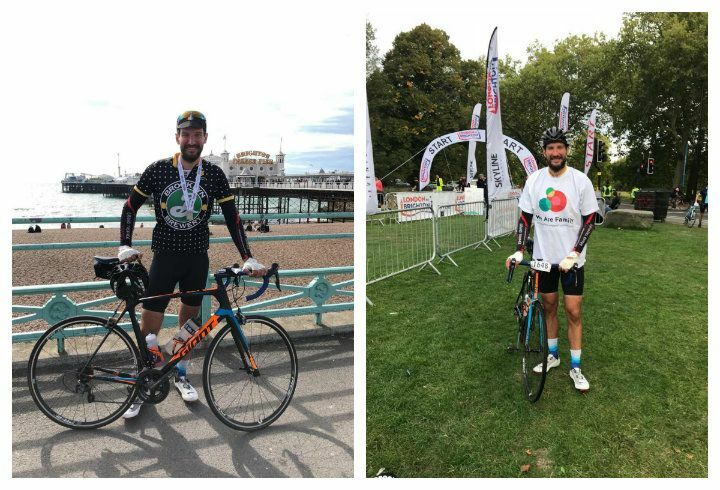 London-Brighton is perfect for those wanting to dip their toe in the shallow waters of sportives rather than jump straight in at the deep end. After collecting my medal and circling round to go to meet my best supporters, my wife and daughter, for a picture in front of Brighton Pier for We Are Family,I saw something that will always be etched in my memory. Time spent on a bike is an enviable opportunity to reflect, but how often do we savour this precious gift that keeps giving? Of course, sometimes there’s no opportunity to ponder the whys and wherefores of life. There’s no reason to unilaterally withdraw from the idle chatter of a friendly group. When you’re racing against the clock, there’s simply no time. And it would be reckless to ruminate if all your attention should be focused on just staying upright. But other times we’re needlessly glued to the Garmin or Wahoo, watching our wattage wane, our cadence climb or an average speed slip. Or we fall prey to an ear worm, replaying that conversation, winning the argument, drafting a snarky email response we’ll never send. Perpetually scrolling through a feed that offers no comfort and has no end. So stop (figuratively). Think. Or don’t think. But at least be grateful. That the sun is straining to shine and the breeze is at your back. That your legs are in painless motion. That your chain isn’t slipping and your crank is creak-free. Life is like Dennis Wise: short and hard. Savour the good bits.